The school will compete in Division I beginning in September 2019. Long Island University is combining the athletic programs of its Post and Brooklyn campuses beginning in the 2019-20 academic year, the school announced Wednesday at a news conference in Manhattan. All teams will compete in the NCAA’s Division I Northeast Conference. The school also announced that upgrades on the athletic facilities at both campuses will begin next year. The change elevates seven teams currently associated with LIU Post in Brookville from Division II. The football team will move into the Football Championship Subdivision, the lower of the NCAA’s two Division I tiers. The program also is adding women’s ice hockey and women’s water polo. No sports are being eliminated in the move, officials said. Teams, drawing athletes from both campuses, will play as Long Island University, and wear uniforms with a blue and gold color scheme. Students and alumni will help decide a new nickname, the school said. 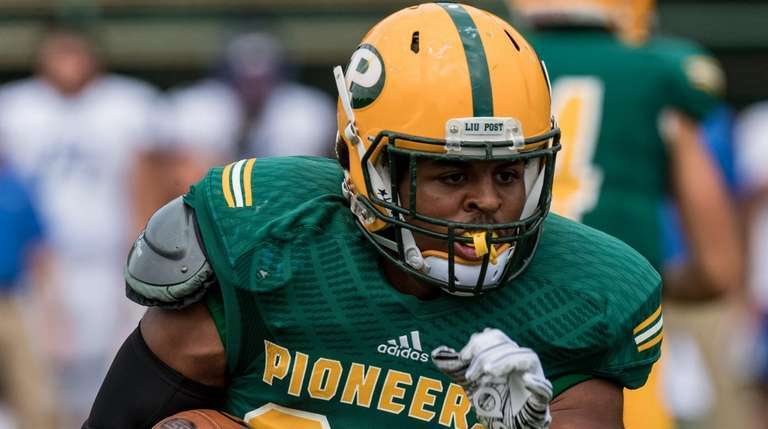 The football team — LIU Post is 4-0 going into Saturday’s game at Shippensburg, Pennsylvania — will move into the Northeast Conference from the Division II Northeast 10. NEC teams Wagner, Bryant and Central Connecticut were all Division II programs before moving up. Merrimack — who the Pioneers defeated, 37-20, on Sept. 29 — is also set to join the NEC next season. LIU Brooklyn dropped football after the 1940 season. LIU’s basketball teams will be based at the Brooklyn campus. The men’s team has had some success on the Division I level, sending teams to the NCAA Tournament in 1961, 1984, 1997, 2011-13 and this past season, when it finished with an 18-17 record. The LIU Post men’s team went 11-18 last season. The school said it will honor all of its current scholarship athletes, including those who do not make 2019-20 rosters. LIU said it worked with the NCAA throughout the process and received waivers that will allow student-athletes to transfer to new schools. “LIU wants to do the right thing and honor scholarships for anyone who has already been awarded aid,” said Northeast Conference Commissioner Noreen Morris. LIU officials believe the move to Division I will increase the school’s profile and help recruiting. A FAQ on the LIU website said that students will be free to take classes at either or both campuses and that the school will provide assistance to any student-athlete who needs to travel from one campus to the other.